A non-refundable deposit of £100 is required upon making a booking, the full balance to be cleared 8 weeks prior to your holiday commencing. The booking in time is 3.30pm, and booking out time is 9.30am. The total number of people coming with you (including children and babies) must not be more than 6. 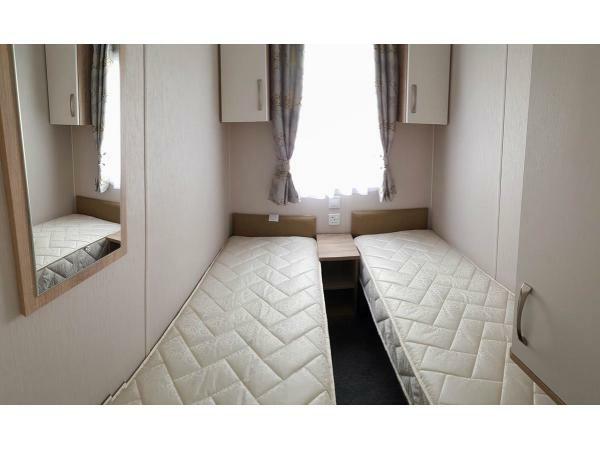 The maximum number of people allowed to stay in this caravan is 6 people inc children and babies). We do not supply a cot. Sorry, no pets. 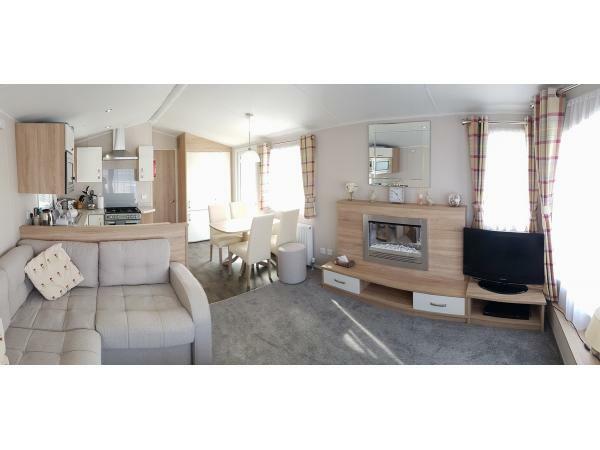 Beautiful 3 bedroom (max 6 people) 2018 Willerby Sierra with a sun deck, double glazing and central heating, situated close to the site rear entrance (pitch white 5) with the beach only a short walk away. The dining area and lounge are in a lovely open style, so you can chat to your group while using the kitchen. There is a dining table with 4 seats and two stalls, a corner sofa style seating and a 32" flat screen TV, DVD player and electric fire. Also double glazing and gas central heating throughout. 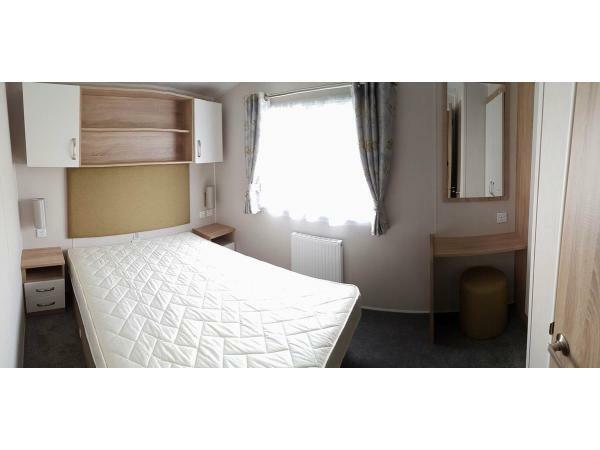 The master double bedroom and both of the twin bedrooms have fitted wardrobes with hangers, duvets and pillows are provided. 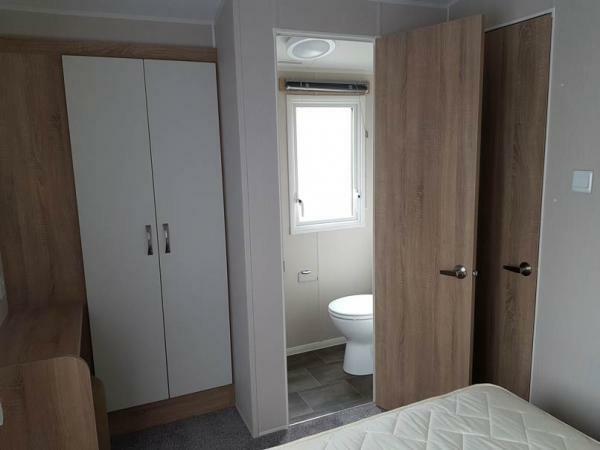 The master bedroom has an en-suite toilet and sink. The shower room includes a walk in shower as well as a sink and WC. 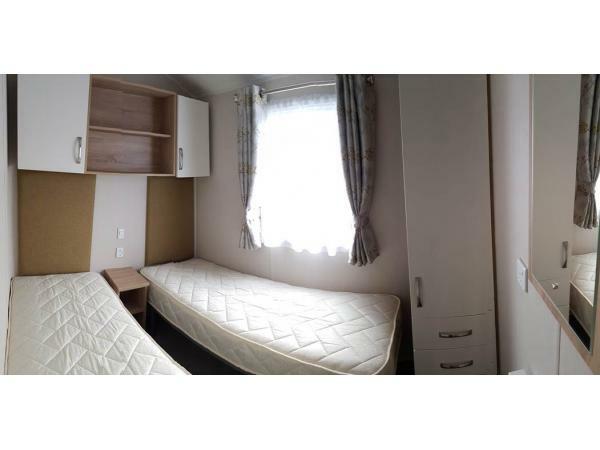 The kitchen is fully fitted and comprises of: fridge freezer, hob and oven, microwave, kettle, toaster, cutlery, crockery and cooking utensils. 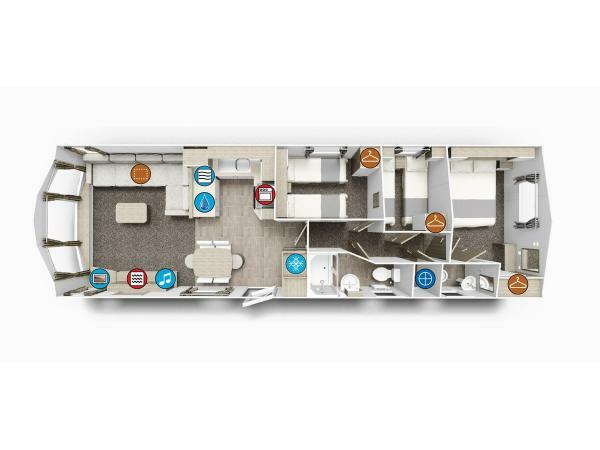 The caravan is set up for use by a maximum 6 people. This includes plates, bowls, cups, glasses, cutlery etc.It also has a range of saucepans, frying pans, and dishes for cooking with. Excluded - Bed Linen - please bring your own bed linen, double bottom sheet and duvet cover for the main bed, and up to 4 single duvets covers and bottom sheets for the other beds, plus pillow cases. Pillows and duvets are provided. Excluded - Towels - please bring towels for showers, hand washing, tea towels etc. 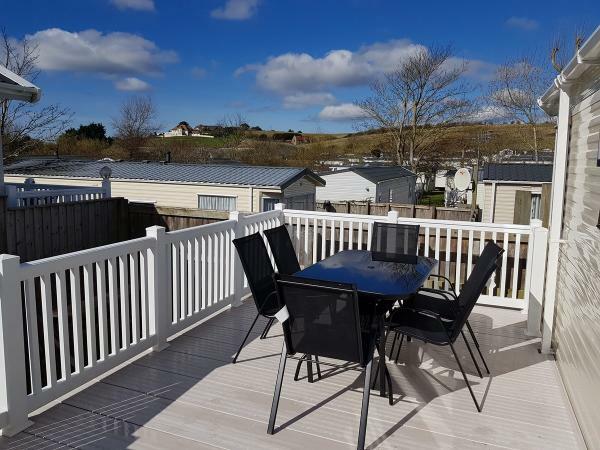 There is a gated uPVC decking area with table and chairs. which catches the sun most of the day. Parking is available alongside the caravan for 2 cars. Onsite there is a sports bar, club, amusement arcade, indoor and outdoor pool, launderette, SPAR store, takeaway, restaurant, spa and gym. Entertainment passes are FREE, there is a small charge for premium areas such as gym and swimming pools, payable on use. As a guide the 2018 price for the swimming pools is £3.60 per day for adults and £2.90 per child. 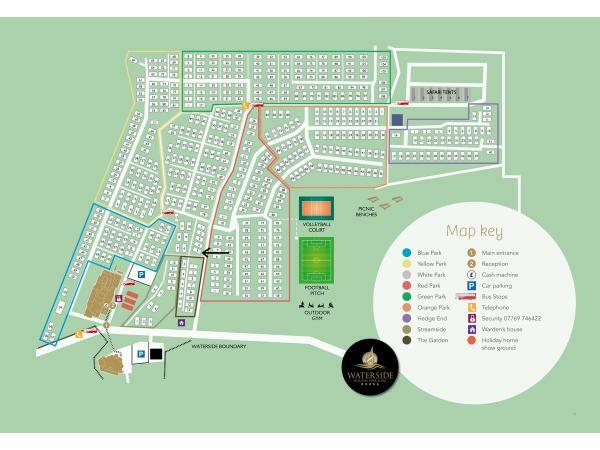 When you arrive Waterside will provide you with keys and further information. Additional Info: Sports bar, club, amusement arcade, indoor pool, outdoor pool during high season, launderette, SPAR store, takeaway, restaurant, spa and gym. Regular bus service to centre of Weymouth. Just to say had a perfect holiday at Waterside. 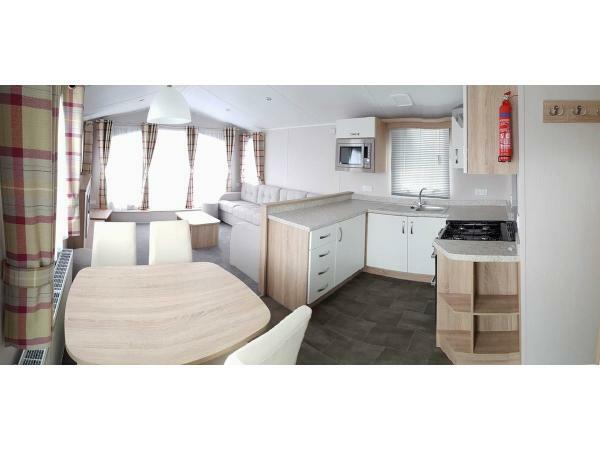 Mikes caravan is absolutely fabulous, all you ever need and more. Lovely position on site, very private and ideal for sunbathing and alfresco dining. Just a short stroll down to the beach where you can take a deckchair or join in with the fun. Most definitely be back again, but unfortunately not this year looking at the bookings. Thanks again, Charlotte and family. Fab fab fab!!! We had an amazing holiday at Waterside Caravan Park. 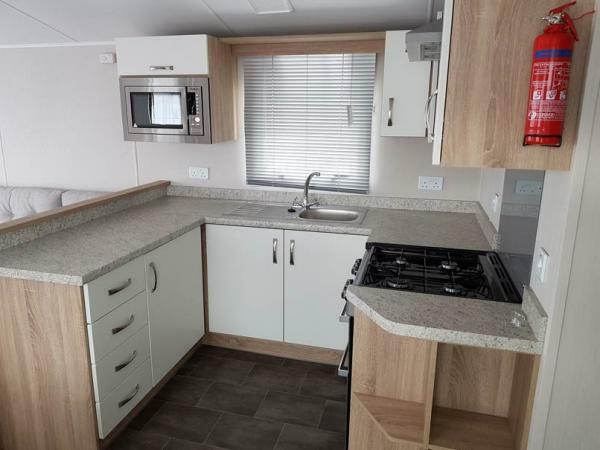 Mike's caravan is beautiful, clean and very well equipped, like a home from home. The site is lovely, very clean with great facilities and a brilliant location, just across from the beach. 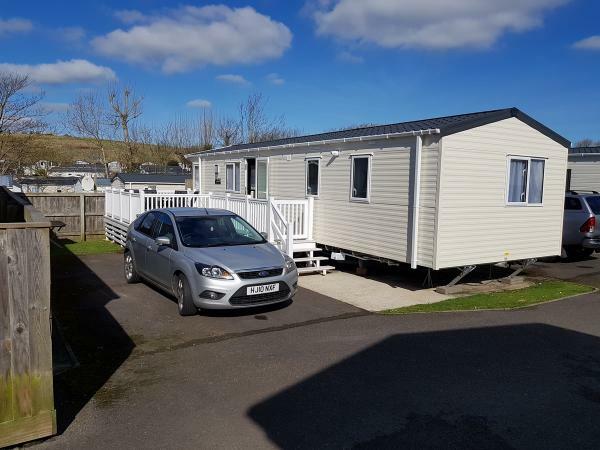 I thoroughly recommend this caravan and site - we will definitely be returning!